Suitcase, September 2014. Original article. It feels more like a town, Trondheim, with its colourful wooden buildings lining the cosy downtown area between the river and the fjord. But Trondheim is the third biggest city in Norway, bringing plenty of charm to the task of being the key metropolis for the country’s central region. Far enough north to get the aurora borealis, and almost far enough to get the midnight sun, Trondheim makes a the perfect city to go for a wander. Here are some great places to stop for coffee. Dromedar Kaffebar, Nordre gate 2. 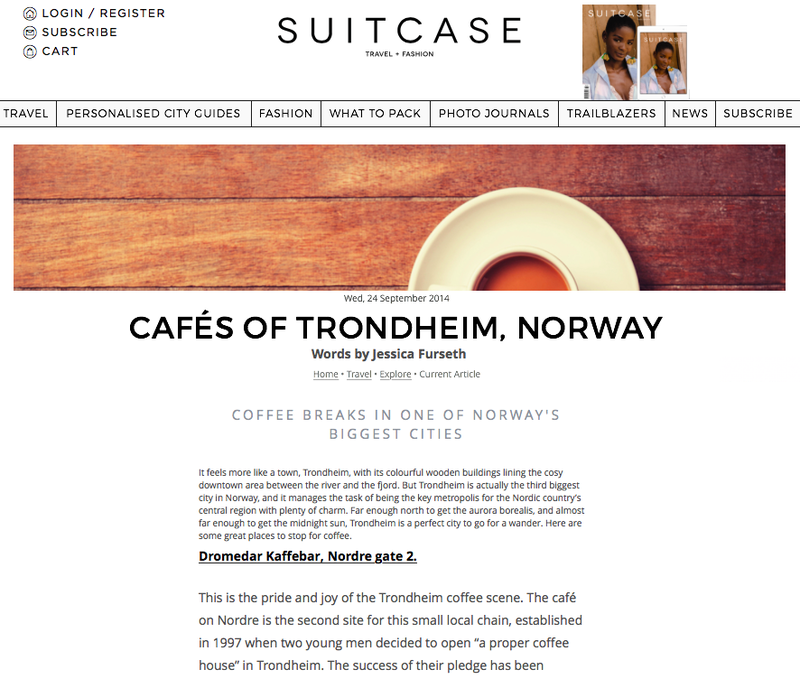 This is the pride and joy of the Trondheim coffee scene. The café on Nordre is the second site for this small local chain, established in 1997 when two young men decided to open “a proper coffee house” in Trondheim. The success of this pledge has been verified time and again, as Dromedar keeps excelling in national competitions for barista arts. The intention for this branch, as well as the ones that followed, was to be a place for locals to meet, and this remains the case today. So whether you’re after a an unpretentious space to have a chat, or you just really want a decent brew, Dromedar will sort you out. Baklandet Skydsstasjon, Øvre Bakklandet 33. Don’t miss Skydsstasjonen – this place is really something to write home about. The coffee and food is good, sure, but the Bakklandet neighbourhood is the true gem of the city. But Skydsstasjonen is worth a stop for the interior alone, whether you go for the fish soup or the herring platter. Or maybe just a coffee and a piece of that Daim bar ice cream cake? In any case, it looks like it’s been decorated by a Norwegian grandma, full of amazing Scandie retro artefacts and some pretty amazing embroidered cushions. The building itself stems from the 1700s, with a long history for selling all sorts of goods including hats and milk, and of course being a travel stop, as the name now illustrates. With 20 kinds of coffee beans, Kaffebrenneriet is a welcome addition to the Trondheim coffee scene. The Oslo-based roastery opened its first Trondheim branch in a beautiful art nouveau building on the main shopping stretch, lovingly restored with furniture and photographs in the original style. Downstairs you can get food too, or have a scoop or two of ice cream that’s made on site: flavours include espresso and cappuccino, or course. Because at Kaffebrenneriet, it’s really all on the coffee: the company claims to serve the best brew in the country. Brave souls should try “Tors Hammer” on the espresso menu, named for the Norse god Thor and his hammer-wielding antics. Choco Boco, Olav Tryggvasons gate 29. Adding this café to the list represents a bit of a risk. Choco Boco is a longstanding favourite in the Trondheim café scene, but a visit in early September found the doors closed in anticipation of a major overhaul. While the results of this change remains a factor unknown, what is certain is that Choco Boco has always been a really great place: get a coffee and read the paper in the morning, pop in for a quick sandwich or salad at lunch, and get a glass of wine there in the evening. Fingers crossed that these features have been preserved once it re-opens. Cafe Bare Blåbær, Innherredsveien 16. Make time for a detour to the Nedre Elvehavn neighbourhood, where this café manages to be both cozy and roomy at the same time. The outdoor seating area has a great view of the beautifully restored harbour, which is now full of bars, restaurants and shops. Locals have taken a shine to Nedre Elvehavn, and if you go there in the summer during the long, sunny evenings you’ll see why. While serving coffee and cakes during the day, Bare Blåbær turns into something more of a bar at night, making it a great place to kick back any time of day. After all, the name, “just blueberries”, is something the Norwegians say when something’s no trouble at all. Posted on 05/08/2017 by Jess. This entry was posted in JF. Bookmark the permalink.